Falls Creek Coach Service F.A.Q. 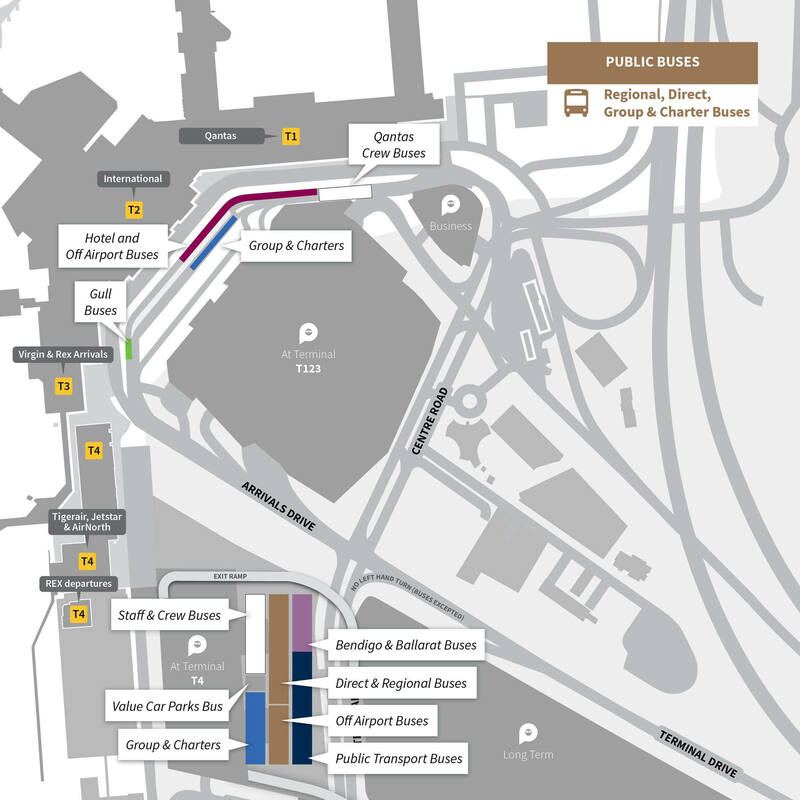 Melbourne Airport pick up at Terminal T4 Direct & Regional Buses 5 min walk from T1&2. See Map here. You can book online, or contact us at the Falls Creek Coach Services Office to book you trip. Can I change my booking/ticket? Should you have selected a Flexi-Fare, yes you can. However with an Early Bird fare you can not. Please refer to the Terms & Conditions for further information, located under "Winter Details". Yes, however depending on the fare type you purchased and the amount of time left until you are due to travel all determines how much of a refund you will receive, if any. Please refer to the Terms & Conditions for further information. Your tickets are automatically emailed to you upon completing your on-line booking, or after booking through our office. Can I purchase an Open Return ticket? Yes you can. Call the office to do so. Can I use my ticket next season? No, sorry. Tickets must be used in the season they are purchased. How many people do we need for a group booking to receive the 10% discount? If there are fewer than 3 lifts operating at Falls Creek, due to lack of snow, two days prior to travel, you can elect to either postpone your booking to later in the current season or to the following season or cancel your booking and receive a full refund less a 25% administration fee per booking. What is Resort Entry and why do we have to pay it? Plus other services provided by Resort Management. The fee is $18.00/adult and $8.00/child. Can I rent ski gear in Mt Beauty or Falls Creek? Yes you can. There are a number of options in Mt Beauty as well as in Falls Creek. There are 2 options right beside our Mt Beauty depot that many passengers choose to use due to convenience. We can point these out to you when you arrive at the depot. What luggage am I allowed to take? Luggage allowance: 2 cases, 1 pair skis and boots per person. Extra luggage allowance can be arranged through the office should room permit, at no extra cost. Southern Cross Station, Spencer Street, Bay 57. (The old Spencer Street Station). We also pick up and Drop off from Tullamarine Airport, at the Transport Hub at Terminal 4. Albury Airport and the Albury Rail Station. From our Falls Creek Coaches terminal at 233 Kiewa Valley Highway, Tawonga South, next to the Caltex Service Station. Day trippers receive free of charge parking. Will the bus wait if my plane is delayed, due to fog or other reasons? We can wait for 5-10 minutes should you only be a little behind schedule, however we can not wait any longer as all our services link up with returning services. Should you miss your bus due to a delayed flight we simply put you on the next available bus at no extra cost. Call our office as soon as you know there is going to be a delay and we can start arranging another bus for you. Yes there are, along with air-conditioning, reclining seats, DVDs and a friendly driver!! Will there be a meal stop on the way to/from the snow? When travelling to/from Melbourne, yes there will be. We stop at the Seven Creeks Hotel Euroa for half an hour. There are menus on board the bus and we ask you to call and order your food as we travel. Then when we stop your food is ready and waiting for you to collect, giving you plenty of time to eat it before re-boarding the bus. Are there movies on the bus? When travelling to/from Melbourne, yes there are. We watch one movie prior to our meal break and another after our meal break. Before you know it you've arrived at your destination! No there is not, as we have found it unnecessary due to our numerous toilet stops along the way. We also found in the past that passengers were unhappy about having to sit next to a smelly toilet all the way to Melbourne!! Plus removing the toilet gives us extra space in the coach.